Last weekend Matt and I decided to venture out to try some wine in the area. We read a good review about a small rustic tasting room and decided to check it out. That particular tasting room wasn't open, but it was on a beautiful farm property with several barns and houses and we stumbled upon another little tasting room. 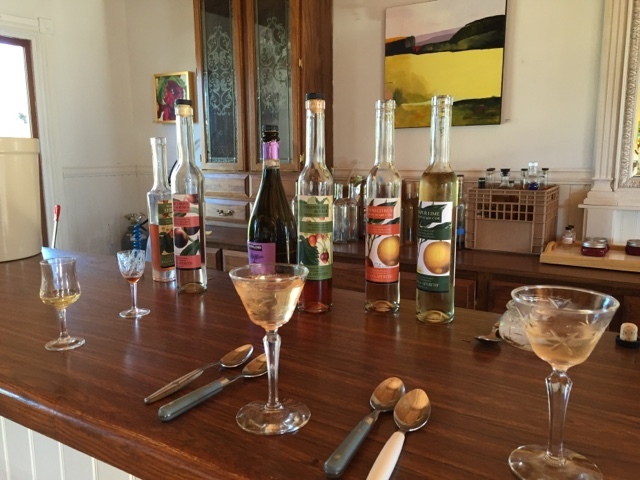 We met Laura, a self-taught wine aperitif maker who founded Sonoma Aperitif. We learned that wine based aperitifs are of the French tradition and she makes her own infused with her own fruit, flowers and herbs. We got to taste some from her summer production and tried several of the plum, citrus and strawberry variety. You can drink them on their own (quite tasty!) or mix with prosecco, sparkling water or a cherry shrub that she makes. She gave us a taste of all of the flavors and made us several little drinks. It was delightful to taste such fruit forward cocktails and hear all about how she makes them. After she bottles the drinks, she takes the leftover fruit and makes jam! We also tried the jam and I was sold. I ended up joining her club so that I can receive a bottle of spirits and a jar of jam every quarter. I'm dubbing this the next big thing. It's pretty, its tasty and you get to drink it out of fancy little glasses. Keep an eye out — it's rolling out to some of the Northern California Whole Foods!